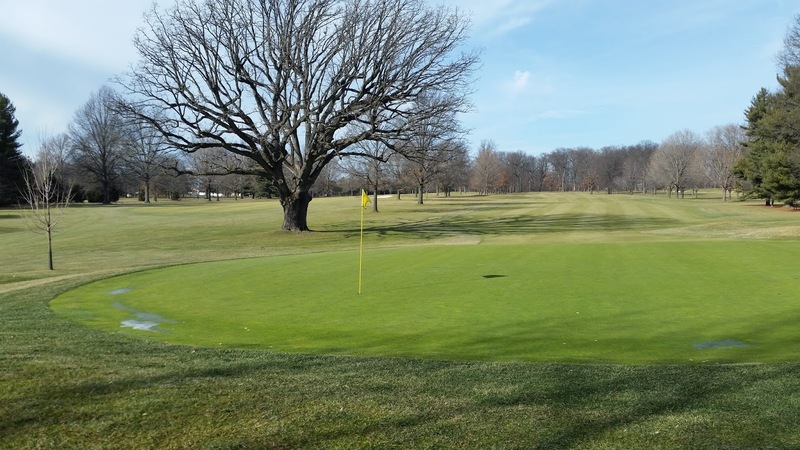 A few of you have started to inquire on the start of the 2016 golf season at Elcona, and while it is still hard to predict an exact date, it is right around the corner. But what signs do we look for in deciding whether to open or not? 7 fairway. Open sun leads to no frost. 6 fairway, a more shaded area. Frost still present! The main sign I look at is the amount of frost in the ground. Year to year, the level of frost in the ground varies, as you would expect. The last two winters had a very deep layer with the extreme cold we dealt with. This year, while much milder, we still had many areas of ground freeze, especially shaded areas. 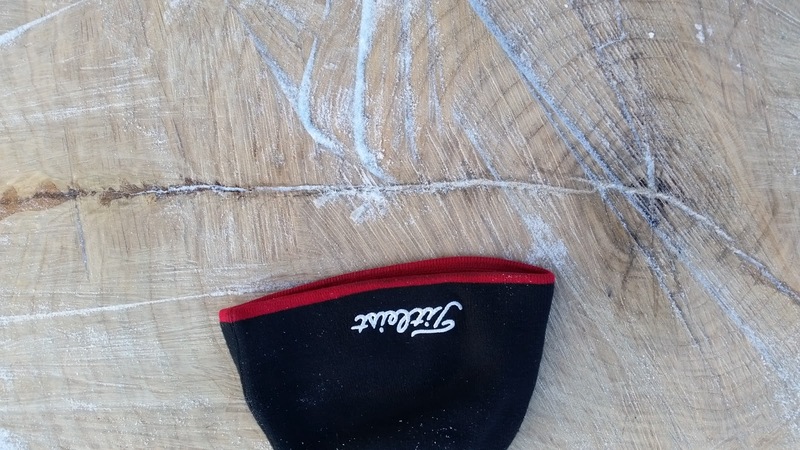 The pictures to the left show the variability in frost layer as I walked the course last weekend. The fairway on hole #7 is exposed to sun most of the day. 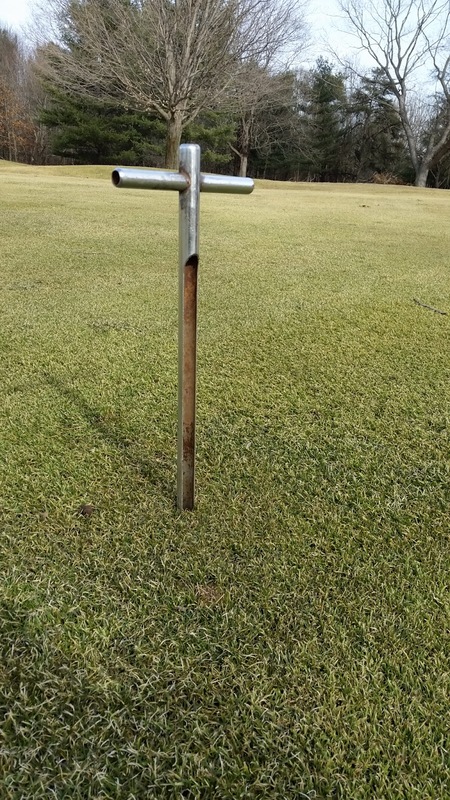 My soil probe went all the way to the ground, a good sign that any surface water left on the turf will drain down due to the lack of frozen ground. The left side of 6 fairway is one area I keep good eye on in early spring due to its higher amount of shade. The probe one went down a couple of inches, indicating frozen ground below. There was a fair amount of water in the surface, because until that frozen ground thaws completely, the water from melted snow and ice is trapped near the surface. In this situation, any traffic, whether foot or wheeled, will cause a rut. 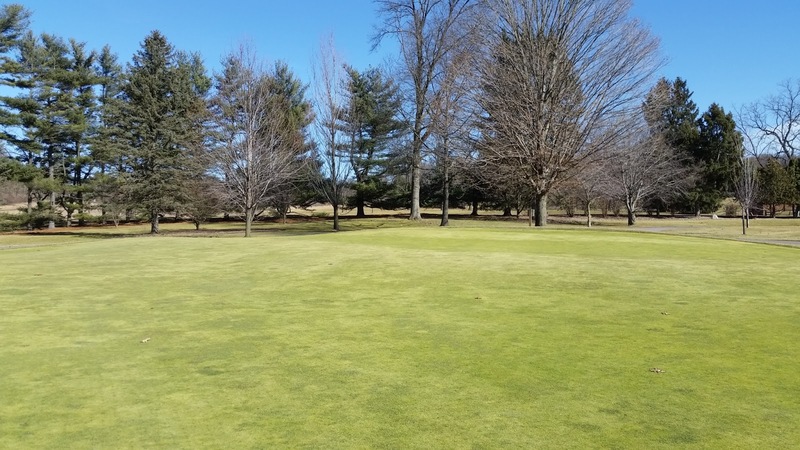 Excess machine and foot traffic on frozen ground can also lead to root shearing on turf plants, which leads to poor turf quality and a longer window for the turf to green up. The soils also need to completely dry and firm up. Wet soils lead to damage from machine traffic and compaction. Playing surfaces also need a period of time to allow proper drainage so we can begin to work them into the firm surfaces you are accustomed to. 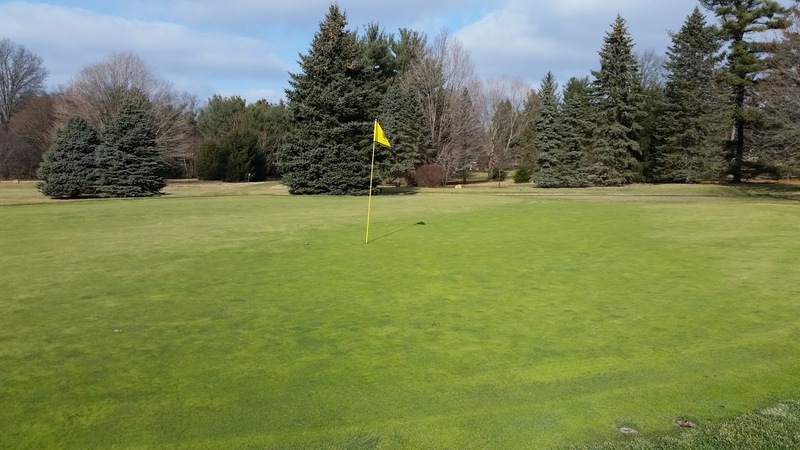 5 Green on February 1. What a difference a year makes. At this time last year, we were in the midst of a 17″ lake effect snow storm. Ice cover was not a major concern, but was in place in lower areas of the golf course. This year we have had quite the roller coaster. Each time we receive a significant amount of snow, it is followed by above normal temperatures that easily melt it away. Tee, fairway, and rough turf achieved a level of dormancy finally over the last couple of weeks, and the greens are slowly catching up. 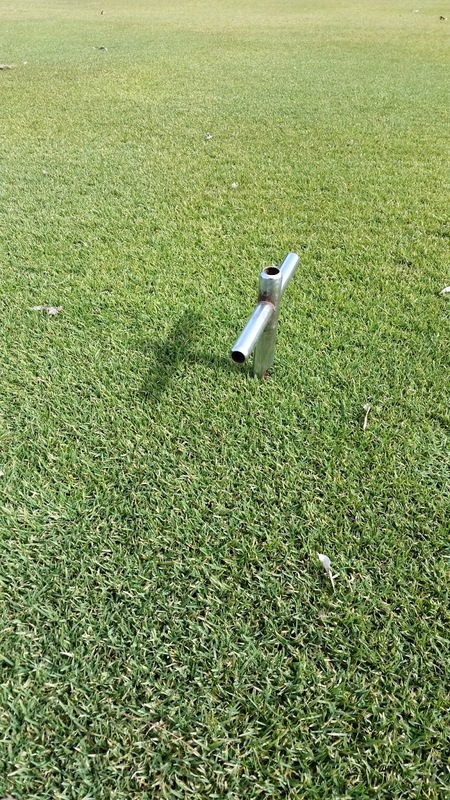 I have noticed some greens have a two toned appearance to them currently, which is not a concern to me. This is where ice and snow cover took a bit longer to melt, and protected the turf underneath from colder air temperatures. 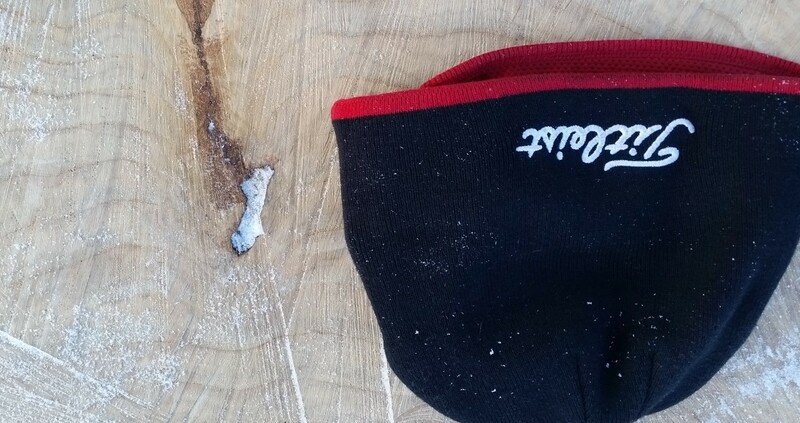 The lighter turf color is where turf was exposed to the elements for a longer period of time. Again, not a concern, but one of the neat attributes that Mother Nature can show throughout the seasons. Our annual tree work has shifted to stump grinding and clean up. One tree that was a subject of conversation and that I have wrote about here was the large Black Oak near #1 green. This tree rapidly defoliated in July and, according to the two experts I had look at it, succumbed to Oak Wilt. It was removed on January 26th by our tree service. 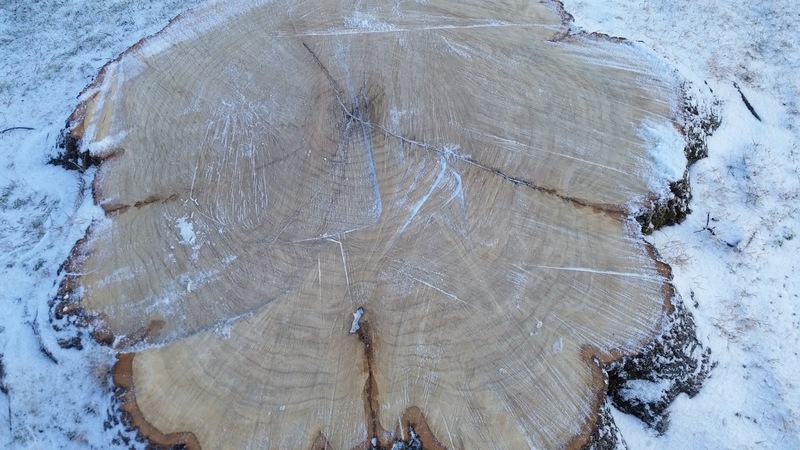 If you would like to read more about Oak Wilt, here is an article from Michigan State. In observing the tree as we were cleaning up the debris, we noticed a couple of other problems the tree had. There was a direct insect trail bored throughout the the entire tree, and some cracking within the main trunk of the tree. All of these symptoms, as well as the Oak Wilt symptoms observed when the leaves were dropping in July, probably together played a roll to its demise. We are unsure if the insect boring led to the fungal infection, or vice versa. According to Michigan State extension, it is a very troublesome disease to diagnose. The takeaway I have had from this tree is learning about Oak Wilt, how to prevent the spread of it, and how to best protect Elcona’s other Oak inventory from this. 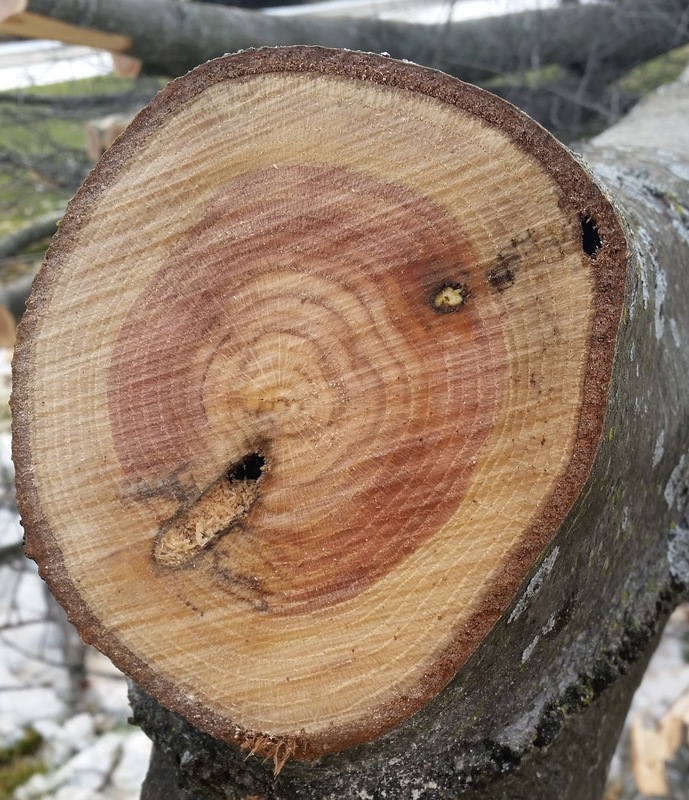 While there is no reason to be overly concerned about it at this time, Oak Wilt is something that we will be continually monitoring within our tree maintenance program. If you have any questions, please do not hesitate to contact me. Have a great weekend!